Whether you’re just starting out in trading or you’re a veteran of thousands of trades, this DVD workshop will bring your trading to whole new level. 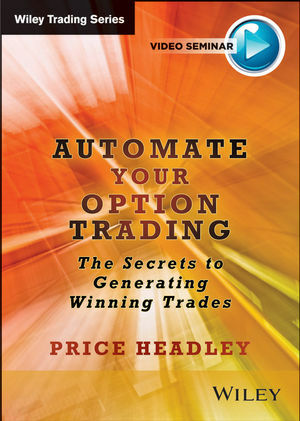 Bestselling author and star trader, Price Headley, quickly gets you up and running with the fundamental elements of good automated trading systems design. Emphasizing the fact that good trading is as much—if not more—about managing your emotions and mindset as it is about managing your money, he explores the thought processes and behaviors of the most successful traders and shines a spotlight on the key role played by confidence. Extrapolating from that, he demonstrates how the best trading systems are those that help traders stay disciplined and confident, and he defines seven simple rules to follow when developing a system of your own. Price Headley is the founder of BigTrends.com, which provides investors with specific real-time stock and options strategies and investment education to help investors profit from significant market trends. Headley has appeared on CNBC and Bloomberg Television, and has been quoted in a variety of national financial publications, including The Wall Street Journal, Barron's, Forbes, Investor's Business Daily, USA Today, and Bloomberg Personal. Headley speaks regularly to investment audiences nationwide. He is a graduate of Duke University and a member of the Market Technicians Association. He is also a chartered financial analyst. Headley was ranked in Timer Digest's top 10 for stock market timing in 2000.